Today was an exciting day, I was able to level my Vampire from yesterdays quest rewards. Through some inspiration from a lot of tournaments today I was able to learn how to use my Hydra Steem Monster combines with other Monster Splinters. With this new development, I challenged various teams led by @kaelci @timturbo @jabi @alex-steem @claygolem and @penderis among others. 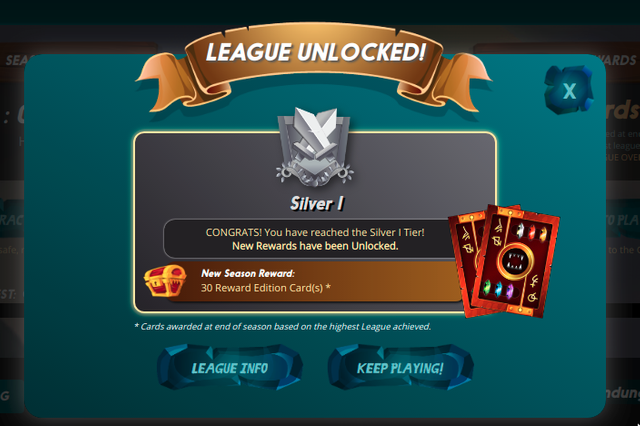 I was able to climb the league to Silver 1 after 1600 ratings, I'm trying to collect as many monsters to level up my Cards so that i can be able to compete competitively on Steem Monsters Tournaments Where I plan to compete with Teams led by @Glory7 @gank and @bigjoy Currently I'm stuck with leveling my Summoners and my Centaur who has proved to be very valuable with her Snipe ability, I'm currently using Centure with Level one ability and I believe I can achieve more with her when she is all leveled up. Today I was lucky on my Daily Quest I got Hobgoblin Rare Monster, Two Vampires who I will use to level up my Level 2 Vampire monster, And finally the Rusty Android - Speaking of Rusty Android since I'm pulling lots of this Monster I'm thinking of leveling up this MOnster and see whats the highest level and how serious are his abilities. Here is the match between me and you. I never use my Sea Genie but I have seen it is a powerful Monster! Yours is way Leveled. That was fun to watch... Maybe because I won haha. Cool cards though, think I will start watching matches. Thanx for the link.